So you’ve decided to travel to the start-up capital of the world, but have no idea what to do? Get your calves ready to explore this fabulous city built on more than 50 hills. Follow this itinerary to see the most of this vibrant city in a weekend. Check into The Herbert Hotel. Trust me, the hotel is surprisingly nicer than its star rating. It has been around since 1909 and is located in the heart of Union Square. It’s perfect location is within a short distance to many attractions. The hotel has 99 guest rooms and offers economic options with shared bathrooms as well as non-shared options. If you don’t mind the commotion, ask for a room overlooking the street for views of the city. First stop? San Francisco’s infamous Chinatown, the largest and oldest in the USA! 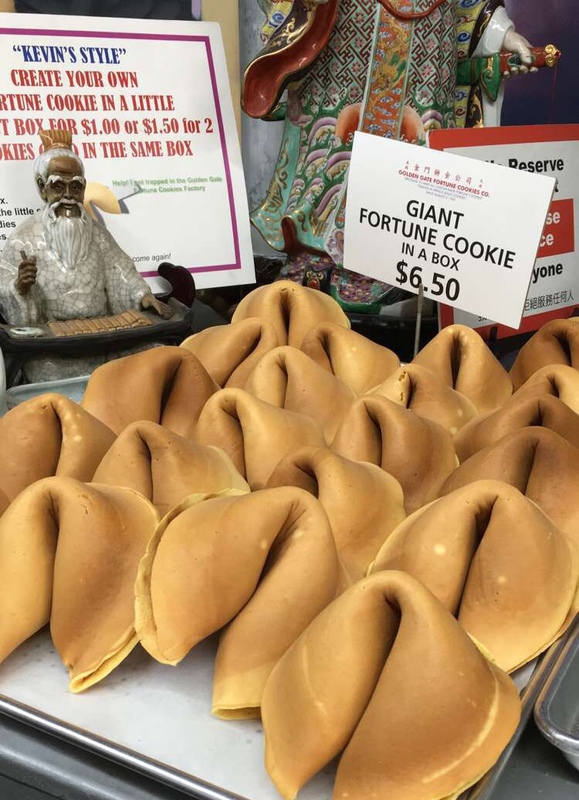 One of the area’s hidden gems is the Golden Gate Fortune Cookie Factory. Keep your eyes peeled because it’s easy to miss since it’s tucked into a hidden alley. The tiny factory is free to walk around and watch workers actually make fortune cookies right in front of you. They ask for a small donation if you wish to take pictures. Samples are offered and tasty flavors are also for sale (think icing with sprinkles fortune cookies). How many opportunities in life do you get to see how your Chinese takeout dessert is made?! Fun fact: The first Chinese fortune cookies were invented in San Francisco! You can’t leave Chinatown without eating true Chinese food, and I don’t mean orange chicken. House of Dim Sum has dim sum comparable to ones I’ve had in Hong Kong. They have just about every type of dim sum you can imagine on their menu. I recommend all of their shrimp and veggie dumplings (yes I tried them all). Note: Three dumplings come in each order and they are fairly large, so order accordingly. Now it’s time to burn off those dumplings and fortune cookies! Biking to the Golden Gate Bridge is an iconic activity that you must do. Rent bikes from Blazing Saddles Tours and Activities and start your cycling journey. The bike path is well marked all the way to the bridge. It’s about eight miles round trip from the Fisherman's Wharf Hyde Street bike shop to the bridge. The bikes rode well (had plenty of gears for those hills) and the price was very reasonable. It’s a very scenic ride so make time for photo stops. Once you reach the bridge it’s up to you if you’d like to bike it. You can be like me and say, “I can’t bike all this way and NOT bike across the bridge.” Or you can play it safe and walk across the bridge. The bridge is very crowded, and though it’s easier for walkers than bikers to cross it, it can be dangerous for both modes of transport. Head back to the hotel and rest up a bit before heading to the Pier for a sunset bay cruise on Adventure Cat Sailing Charters. Snacks, a couple of drinks and jackets are included in the ticket. This is a beautiful time to see the Bay and the Golden Gate Bridge. You may even spot a whale if you're lucky enough! After disembarking on your boat cruise, sit down for dinner and drinks at Sabrosa. Get there before 11pm to enjoy dinner because after that, the tables are taken away, the DJ arrives and the dance party begins! The tacos are delicious here (make sure you also order a margarita pitcher) and the music is on point. To be specific, the music is a mix of top 50 and reggaeton. If you don’t know what reggaeton is, it’s a mixture of hip-hop, Latin American and Caribbean music typically in Spanish- think Despacito. Start your day by going to prison, Alcatraz that is. The federal prison located on Alcatraz Island, in the waters of the San Francisco Bay, was home to some of America’s most dangerous criminals. Among the most famous was the notorious gangster, Al Capone. Though over a dozen escape attempts were made on Alcatraz, no inmate was successful. Fun fact: Guards kept the prison cells warm so that the prisoners would be shocked when trying to escape through the chilly waters and have to turn around. Tours range from 2 ½ to 5 hrs. Now it’s time for some grub. Leo’s Oyster Bar may be one of the cutest (read as Instagram heaven) spots I’ve EVER been to! 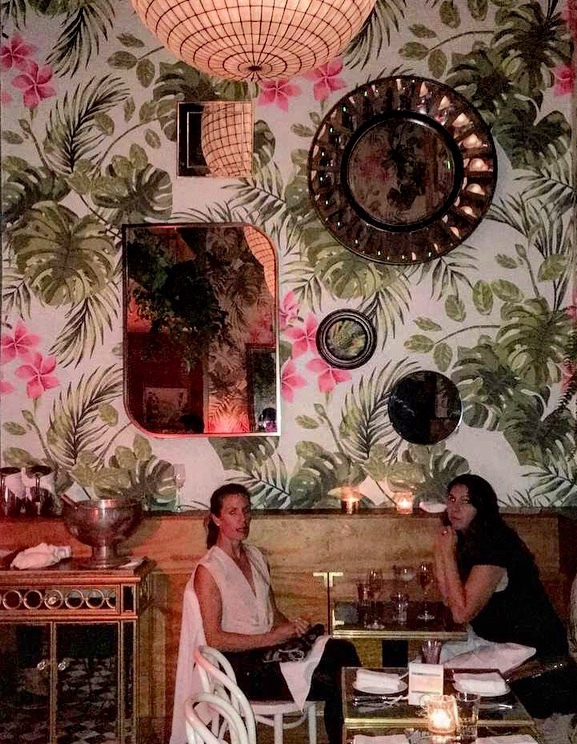 If you’re planning on taking pics in front of their decorative wall, plan on making early reservations for when they open at 5:30pm. Though the majority of the menu is for seafood lovers, there is a small selection that doesn’t include seafood. With that being said, if you could only get one thing at this restaurant, I’d recommend one of their cocktails! When in season, the watermelon cocktail is to die for! After you’ve refueled it’s time to head to a must-see destination, the Painted Ladies! Take a five minute rideshare from the restaurant to this popular attraction. These colorful houses were built in the late 1800s and withstood the 1906 earthquake, so they’re the real deal. The houses are symbolic of the Gold Rush Era when new money in San Francisco wanted to show off with lavish houses. The row of houses have appeared in over 70 movies and television shows. This attraction shouldn’t take too long because the houses are private homes so no tours are available. Take some time to rest up back at The Herbert Hotel before feasting on a delicious meal at Flores. You may have assumed by now that this spot is also a very trendy, Instagram-worthy destination. My personal favorites are the Esquite, Chile Relleno en Nogada (I ordered vegetarian version) and a pitcher of the Paloma margarita. If you’re up for a night of drinking in an exotic bar, Smuggler’s Cove may be the place for you. Inside the bar is a mixture of tiki relics and nautical décor serving up Caribbean style drinks. If you want flowers in your drink or a tiki mug, you’ve come to the right place. The bar has been named as the one of 'The World’s 50 Best Bars' six years in a row, so it’s sure not to disappoint. Take Sunday to be lazy and leisurely explore San Francisco’s neighborhoods. With this being said, before designating Sunday as my chill day in the city, I started off my day partaking in a donut challenge. Yep, you read it correctly, a donut challenge. If you’re as much of a donut fanatic as I am, you’ll love this. Bob’s Donuts bakes a gigantic donut that is about 14-15 donuts combined. If you you’re able to eat the donut in under three minutes you receive a t-shirt, a hat and your name on the ‘donut wall of fame’. If you finish the donut in under two minutes you receive all of the above plus a refund on your donut ($10). You have the choice between original, cinnamon crumb or chocolate donut as well as milk or water to help wash it down faster. At the time that I participated in this challenge only 150 names were on the wall…that’s out of thousands. Sadly I had to stop in under two minutes but I will train and definitely be heading back there in the future! Feel free to do the challenge at any time/day that they're open, no opponents necessary. Life hack: You can take the leftovers home with you. After stuffing your face with a massive donut, literally, it’s time to walk around before going into a food coma. From the donut shop, it’s about a 1 ½ mile walk to an eclectic neighborhood called Hayes Valley. This is a great spot for some boutique shopping, sipping on coffee at one of their makeshift outdoor cafes or grabbing a bite to eat at one of their trendy restaurants. The neighborhood also has a community garden and a park with art installations. Before your time in San Francisco comes to an end, you can’t leave without experiencing two things: a cable car ride and taking in the scenes at Dolores Park. Fun fact: The cable cars are the only National Historic Landmark that can move. From Hayes Valley, take about a 10 minute cable car ride to the infamous Dolores Park. Once there, stop by a nearby grocery store to pick up some wine and cheese for a picnic. Dolores Park is a hotspot for picnickers (yes, alcohol is allowed), tight-rope walkers, musicians and outdoor lovers. Now is the time to go into that food coma you've been fighting and take a nap on the lawn. San Francisco is huge and it leaves you wanting to come back to see more, with this itinerary you’ll be able to see some of the most iconic spots of the city all in one weekend. If you plan on renting a car while in the city, I recommend using the Turo app for the best deals. If a car is in your plan, I’d make the drive across the Golden Gate Bridge to Marin Headlands for some breathtaking views of the bridge, bay and all of the city. If you plan on exploring the wineries in Napa while on your San Francisco trip (67 miles), check out my day trip to Napa Valley itinerary.